Posted on September 28, 2017 by Smorgasbord - Variety is the Spice of Life. Sally’s call for our favourite cook from scratch recipes comes just in time for me as we Canadians celebrate our Thanksgiving Monday, October 9th this year. I’ve used this recipe for decades, only I’ve altered it through the years to accommodate my gluten-free diet. And it still gets rave reviews. This was my beautiful Aunty Sherry’s recipe. She wasn’t known for her gourmet cooking skills, but often made up recipes on the spot that just stuck around. I’ve also seemed to inherit that wonderful skill from her, lol. This stuffing recipe originally was invented for her Stuffed Pork Chop recipe which became a favorite of mine and my siblings when we were kids, and its versatility transformed it into a Turkey Stuffing recipe that I’ve used ever since – with a few tweaks. Because neither my aunt, nor I were ever big on measuring ingredients (mad chefs! ), measurements will be approximated. My aunt introduced me to the ‘taste as you go’ method, which is pretty much how I roll in the kitchen, yet my husband and my guests love my cooking. Just don’t ask me how much of what I put in because it’s magical. I do make some of my favorite dishes frequently, but as you may well imagine, some days the product comes out tasting different from the last time I made it. As you can see, I’ll never make it to Masterchef on TV, but I promise, this stuffing is a great go to, and it’s delish! Now, let’s get on with the recipe! *Note – This recipe was traditionally made with Jewish Challah bread because of the rich, fluffy texture of the egg bread with a slightly sweet taste to it. But it can be made with any bread of your choice. I’ve substituted for years with gluten-free bread, and none of my guests ever noticed and always ask for my recipe so it’s almost foolproof! I’ll list ingredients for using a loaf of bread. Traditionally, bread measurements are – 1 cup of cubed bread for every pound the turkey weighs. First, dice or chop up the peppers and onions and saute them in butter for about 5-10 minutes till they soften. Then place in a bowl and let them cool while you continue preparing the bread. Have a mixing bowl ready and start taking each slice of bread, one at a time and hold it under water to soak it, then squeeze out the water in one hand, forming the slice into a small ball and place in the bowl. Continue this process with the rest of the loaf. Now add your eggs and saute mixture to the bowl and season with salt and pepper and sage to taste (if you don’t enjoy the taste of sage you can omit, but it adds a nice kick). Hand squash and mix to blend all ingredients. Voila! You have your stuffing mixture. Now you can stuff your turkey with it and add the excess stuffing to a lightly buttered baking dish. To cook the separate dish of stuffing, cover it with tinfoil and bake with the turkey for approximately 45 minutes to an hour, removing the foil for the last 10 minutes. If you’d like to make the stuffing only in the baking dish, preheat the oven to 350 degrees and bake for 45 minutes to an hour, removing the tinfoil cover for the last 10 minutes. About D.G. 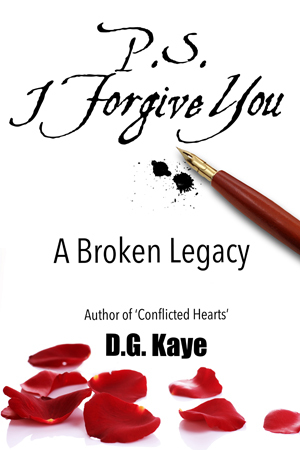 Kaye’s latest book P.S. I Forgive You. My thanks to Debby for this delicious stuffing recipe for not just the upcoming holidays in Canada, America and Christmas but to accompany any meat or poultry dish. Sounds good and easy to make, too. That’s important in my kitchen because if there’s a way to mess up, I can find it! And I love stuffing – you can skip the rest of the meal, just give me the pot. Ha ha. Thanks, Debby. And thanks to Sally for the fun series. Another great recipe, similar to the one handed down from my great-grandmother. Even though I no longer eat turkey, I make it for my hubby and guests. I do eat the stuffing though. Enjoy the upcoming Canadian Thanksgiving D. G.
Dearest DG, we forgive you for having a panda picture there. Delicious post, Sally. I love bread so, of course, Debby’s recipe sounds delicious. Here’s one that might tempt your pallet. A dash of poultry seasoning, salt, pepper, and parsley. Put the raisins into a pot with the apple juice and heat until hot and the raisins are plump..
Cook the rice and put it aside to cool. Depending on how much stuffing you want to make, cut up an apple or two or three into bite-size pieces. When the raisins are plumped up add to the dry crushed bread and a stick of real butter, add the rice, apples, and seasonings.If it looks too dry add some more apple juice. Mix well and taste it. You will know if it needs more seasoning. You can bake it separately or stuff the turkey or both. I usually take some of the turkey drippings and add them as it bakes. I hope you give it a go and enjoy it. Happy Thanksgiving. Hugs. A great recipe, Debby. Perfect for Christmas time which is fast approaching. Delicious! The next best thing would be being in the kitchen with Aunt Sherry or Debby. The not-exact measuring sounds like a cooking party, and perfect stuffing. Happy holidays, Debby. You’re welcome, Debby. Best to you! Love that word ‘guesstimation’ 🙂 Same here! I remember my mom cooking at the stove and using the “taste as you go” method. Must have been what made her food so good. Loved your share on your Aunt and family recipe. The recipe is a simple one and promises lots of good flavor. My cooking style mirrors yours: I taste as I go along. And yes, it may be totally different next time. Thanks for sharing your recipe.